The 15th Earl of Kinnoull, who died in Perthshire on 7th June, held his title for 75 of his 78 years and spent well over 40 of those as an active and respected member of the House of Lords. Arthur William George Patrick Hay was born on 26th March 1935, the son of the 14th earl and his second wife, a daughter of Kate Meyrick, the celebrated London night club hostess of the inter-war era. He succeeded to the title at the age of two, in March 1938, following his father’s premature death from pancreatic cancer. By the end of that year, his mother, too, was dead; the orphaned Kinnoull and his older sisters were thereafter brought up by an aunt and uncle, Lord and Lady de Clifford, in Gloucestershire. 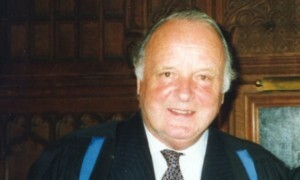 He was educated at Eton and the Royal Agricultural College, Cirencester. A lifetime’s career in farming and land management followed. He became a Chartered Surveyor and a Chartered Land Agent and was Senior Partner in the Edinburgh land management firm of Langley Taylor for more than 30 years. Kinnoull developed a wide range of business interests that extended from his farm in Perthshire to farming seafood in West Africa and serving as a Non Executive Director of the Woolwich Building Society. His main interests were in the agriculture and fishing industries. His interest in Scotland’s culture and heritage was extensive and he was one of the first Patrons of the Clan Hay Society upon its foundation. Clan Hay has been proud to retain him in that capacity for the last 62 years. On reaching the age of 21, the Scottish earl lost no time in taking up his seat in the House of Lords under his Great Britain title, Baron Hay of Pedwardine. The young earl’s maiden speech was well received, reported as ‘very capable and most informative,’ and this was the beginning of a long and distinguished parliamentary career in the Upper House. Lord Kinnoull married Gay Lowson, a daughter of Sir Denys Lowson, baronet, of Westlaws, Perthshire, who survives him together with their son and three daughters. His only son Charles, Viscount of Dupplin, succeeds him as 16th Earl of Kinnoull.